In the early part of last year I declared 2009 the Year of Joy. I was going to declare every year going forward some pithy name. I have now, a year later, decided that was stupid. Although it DOESN’T mean 2009 was not filled with joyful events. It was. In fact, I’ve had some of the best moments of my life this past year. Remember last year how I said I was going get rid of a few clients who were, to put it nicely, a slight pain in the buttocks? I did that, and amazingly, I actually made more money this year than I did last. I’m still blogging for several outlets, doing online articles, and writing for clients, but I’m mindful of my schedule and overextending myself. Speaking of which, a few months ago I stepped down from my Dating Feature Writer position at Suite101. I was, to put it mildly, a bit burned out. I had a few hundred dating-related articles, and while I still write about dating for other places, I was just worn out on doing one a week for them. The good news is that they convinced me to stay on as a Contributing Writer. I have less of a commitment in terms of articles and I can write about any subject I please. I did a few speaking engagements this year, and it was truly a blast. I gave discussions on online dating and on the writing life to various organizations, and worked with truly wonderful people who made it all so very easy for me. It was great to get out and connect with people, and the extra money didn’t hurt either. I’m not a technical person. We all know that by now, right? So it was especially exciting (and hard…. and frustrating) for me to move my personal blogs off of Blogger and on to a WordPress platform. Now that I have, I am so very glad. Love WordPress and the flexibility it allows you. My new blogs are, in some cases, a combination of old ones. This blog came from my Beautiful Words blog and my personal blog, The Difference Now. I also rolled the Working Writers blog over, and it has grown steadily over the last few months. I’ve focused a lot of attention on this blog and it’s paid off. Traffic has grown to about 6,000 unique visitors a month and 85,000 pages. I’ve played around with sponsors (a first for me) and I hope to continue doing that in 2010. I’d like to form a logical partnership with someone that made sense for the blog. We’ll see what transpires. In the meantime, I’m having a blast chatting with so many different authors and readers. I got to interview my all-time favorite writers like Elinor Lipman, Sandra Byrd, M.J. Rose, Robin Maxwell, and Margaret George. I was introduced to writers like Leila Cobo, Lucinda Rosenfeld, and C.W. Gortner. I reconnected with favorites I had seen at book signings, like the fabulous Kris Radish and Sandra Dallas. The Dating Blog got a new home and has grown steadily in visitors. I’m getting about 2,000 unique visitors and 20,000 hits a month. I also started the site Help Someone With Diabetes to highlight all the latest news on the search for a cure. I released an ebook of dating ideas this year, as well as a short guide to the personal side of diabetes called 21 Simple Things You Can Do To Help Someone With Diabetes . (As you can see, I’ve kept with my habit of long titles!) My books Father’s Eyes and Internet Dating Is Not Like Ordering a Pizza have also sold pretty well. All in all, I was pleased with my publishing efforts this year. I also finished writing the novel I started five or six years ago, and am currently in the search for an agent. This is a whole new world for me so I’m learning all I can and excited at the possible opportunities. Can I possibly reflect back on 2009 without mentioning crocheting? I love my hobby, but alas, didn’t have much time for it this year. I did manage to make a few hats and scarves for a few friends and close family members, but not nearly as many as I would have liked. I’m already working on a new afghan for our house, however, so hopefully my 2010 output will be much higher. 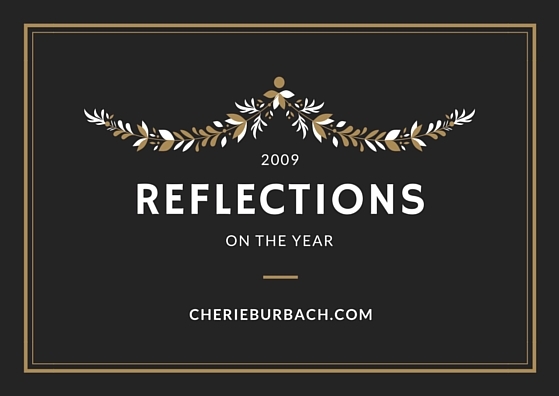 Perhaps the most exciting thing about reflecting back a year is seeing how far you’ve come. I have a happy life filled with wonderful friends. My marriage is truly one of the biggest blessings I have ever been given, and I thank God daily for this gift. I look forward to seeing what 2010 has to bring! « St. Nick is a Milwaukee Thing?